The Vietnamese nation was formed through a process of two major ancient cultures, the Chinese and the Indian. Thus a peculiar trait of Vietnam’s culture was formed. As far as anthropology is concerned the Vietnamese people have their origin in the Mongolid race, believed to be one of the major or races of the world and often found in northern and eastern Asia. – The Tay – Thai Group includes 8 ethnic groups: Bo Y, Giay, Lao, Lu, Nung, San Chay, Tay, Thai. – The Mon – Khmer Group includes 21 ethnic groups: Ba Na, Brau, Bru-Van Kieu, Cho Ro, Co, Co Ho, Co Tu, Gie Trieng, Hre, Khang, Khmer, Kho Mu, Ma, Mang, M’nong, O Du, Ro Mam, Ta Oi, Xinh Mun, Xo Dang, Xtieng. – The Mong – Dao Group includes 3 groups: Dao, Mong, Pa Then. – The Kadai Group includes 4 ethnic groups: Co Lao, La Chi, La Ha, Pu Peo. 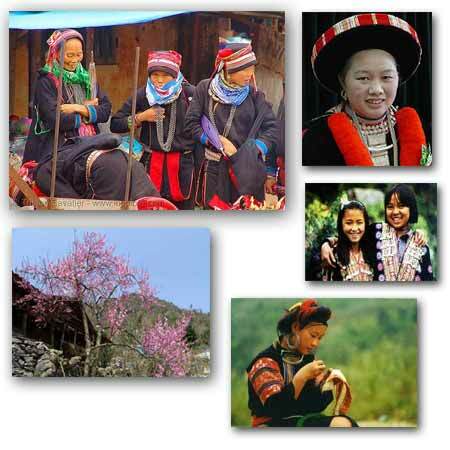 – The Nam Dao Group includes 5 ethnic groups: Cham, Chu Ru, Ede, Gia Rai, Raglai. – The Han Group includes 3 ethnic groups: Hoa, Ngai, San Diu. – The Tang Group includes 6 ethnic groups: Cong, Ha Nhi, La Hu, Lo Lo, Phu La, Si La. In the core of the history of national development, all these groups of people have been closely attached to one another in sharing the same tasks of fighting against foreign invaders, defending the country’s territory, gaining the right to live and the right to national independence and self-determination. Each group of ethnic people have developed their own language and identity, thus making the Vietnamese culture, long known for its variety, a well blended combination of different cultures.